Nokia confirmed its Lumia Amber software update has started to roll-out for the company's Windows Phone 8 devices. The headline feature in this fairly significant software bump is the new imaging experience, which brings other WP8 Lumia handsets up to speed with the Lumia 1020 (obviously minus the massive 41-megapixel sensor). Amber will bring improved image processing, noise reduction, color reproduction, exposure control, autofocus and better performance in low-light, according to Nokia. 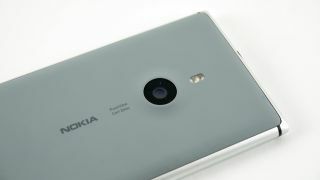 The Nokia Smart Camera app, which debuted on the Lumia 925 and features prominently on the Lumia 1020, is also open to other Lumia users running Windows Phone 8 on their handsets. "The app brings a slew of different options – use Best Shot to find the sharpest image from a series of ten; combine several shots of people in movement into one with Action Shot; heighten the appearance of speed by blurring the background with Motion Focus; create ideal group shots by choosing the best faces from a series with Change Faces, or remove unwanted objects from your pictures." Beyond the camera features, Amber brings the new Glance Screen functionality on board, which displays a clock, battery meter and informs users when the phone is in silent mode, even when the display is locked. Users will also be able to flip the phone over to activate silent mode, while double tapping the screen will unlock the device. There's also some minor improvements to the Here Maps app. Lumia owners with Windows Phone 8 handsets can check whether the update is available in Settings > Phone Updates.